His outstanding qualifying performance not only causes Marc Marquez’s opponents in MotoGP to constantly run from behind, but also secures the Spaniard the fifth BMW M Award in a row – a record that for the foreseeable future will probably only be endangered by himself. The 2017 BMW M Award is the 15th edition of MotoGP’s Best Qualifier award, honoring the rider who achieves the strongest overall performance in one-season qualifying sessions. With 343 points, Marc Marquez secured the M Award with sovereign 86 points ahead. As a reward for his performance, the motorcycle high-flyer from Spain can look forward to a brand new BMW M4 CS. 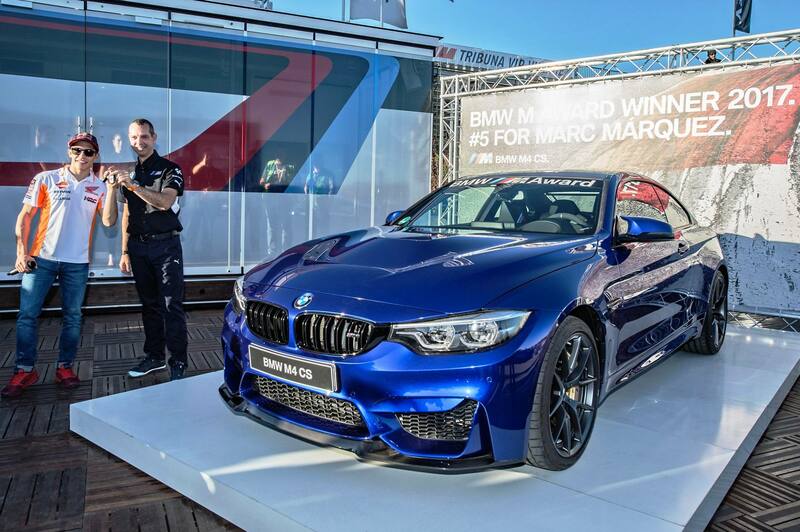 The 460 hp sports coupe was officially handed over to him today in Valencia and is painted in the exclusive San Marino Blue. In the history of the MotoGP BMW M Award, Marquez was able to extend his position as the sole record holder, with five wins. With three victories each, Valentino Rossi and Casey Stoner follow, while Jorge Lorenzo was twice happy to receive a sports car from Garching. One victory each was celebrated by Sete Gibernau and the late Nicky Hayden. Frank van Meel (Chairman of the Management Board of BMW M GmbH): “One can only take the hat off of Marc Márquez: Since 2013, he is the fastest qualifier of MotoGP and thus unbeaten in the BMW M Award. Congratulations to the fifth win in a row.